Interview with Rosemary Heather, On Art and Populism Blog, Kunsthalle Wien, 2015. As an important and useful response to this violent (false) universalism, we have seen the development of fields like post-colonial theory, identity politics, queer theory and strands of feminism that highlight marginalized perspectives and voices lost to Modernity’s “inflationary” modes of operation. Addressing critical issues like the “site” or context “from where one speaks” has been a collective effort to emphasize the importance of particularities and give necessary attention to unheard voices and unmapped positions (in art, we saw these tendencies manifest in site specific practices, for example). After decades of such theorizing, though, this almost exclusive focus on particularities has lost sight of the global neoliberal hegemony we are all forced to live by. Calling for a reworking of the concept “universal” should not be taken as a side-swipe against those invaluable theoretical contributions mentioned earlier. It is to face up to their inherent limits in the face of the hegemonic core that has only increased in dominance, and whose scale is gargantuan. It would be a failure to not properly acknowledge those limits and overestimate the usefulness of certain theoretical frameworks, just as Levi Bryant has pointed out how Lacanian psychoanalysis does not offer sufficient tools to adequately examine something like climate change, for example. 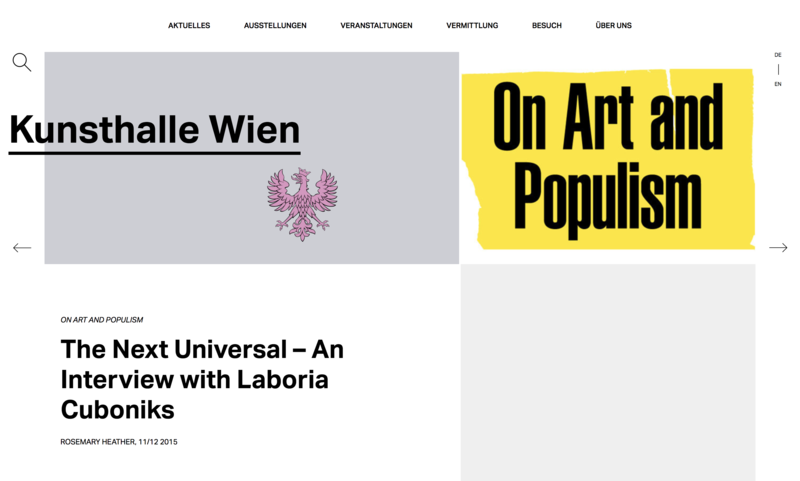 Laboria Cuboniks in Interview with Rosemary Heather, On Art and Populism Blog, Kunsthalle Wien, 2015.